The idea of invisibility has fascinated people for millennia, inspiring many myths, novels, and films. 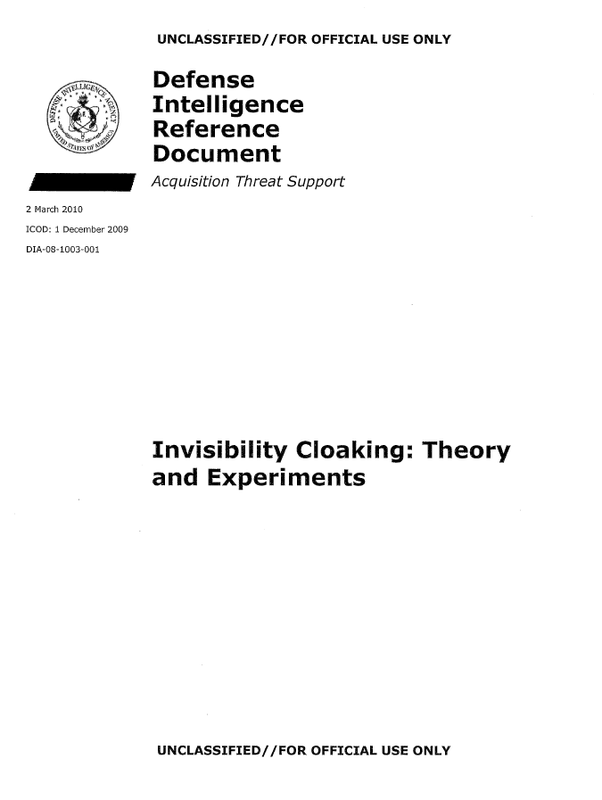 Invisibility cloaking has recently become a subject of science and technology. This paper describes the important current theoretical and experimental developments and tries to project into the future. Invisibility may be achieved through three principal methods: camouflage, transparency, and cloaking. Many animals and some plants use camouflage to disguise themselves from predators-for example, by assuming the shapes and colors of objects in their surroundings. The military has long used forms of camouflage; a recent military application of camouflage is stealth technology. Stealth planes have aerodynamically unusual, edgy shapes and are coated with a special material. Both features serve the same purpose: to make the plane “invisible” to radar. How does it work? In radar, electromagnetic microwaves are emitted by a source, and their reflection by an object-an airplane, for example-is detected. From the direction and the time delay of the reflected waves, the direction and distance of the object are inferred. If the object does not reflect the electromagnetic microwaves back to the source, it will not appear on the radar. This is precisely what stealth technology achieves. Owing to the edgy shape of the stealth plane, most of the incident electromagnetic waves are reflected in different directions; the coating of the plane absorbs the rest. In this way, the stealth plane has become completely black in the spectral range of radar. As for radar waves, the sky is black, not blue, and the plane has assumed the color of the background: the stealth plane is camouflaged. As light is simply an electromagnetic wave with shorter wavelengths than microwave radiation, one could imagine an optical cloaking device as the microwave cloak but with much smaller cells, fitted to the smaller wavelength. However, this simple idea is too simple, for two different reasons. One is that metals like the copper of the circuit board or the gold of ruby glass are more electrically resistant to currents oscillating with the frequency of visible light than to currents in the microwave range of the spectrum. Second, and more important, the cells of a metamaterial also emit electromagnetic radiation in an incoherent way, not just as a coherent response to the incoming electromagnetic wave, similar to the spontaneous emission of light by atoms and molecules. The spontaneous emission is significantly stronger in the optical range of the spectrum. In short, metamaterials do not scale; they must be designed differently for visible light, and the loss of light by absorption and incoherent scattering usually is greater for visible light than for microwaves. Figure 13 below illustrates the idea 19 for an optical cloaking metamaterial. Instead of split-ring resonators, nano-scale metal wires are embedded in a transparent host material, for example glass. The wires replace the split-ring resonators on the circuit board of the microwave-cloaking device. They act similarly to the gold particles embedded in ruby glass; their optical properties depend on their lengths and on their arrangement, which, in principle, can be tailormade and controlled using the tools of modern nanotechnology. The thin wires will have lower electric losses than split-ring resonators, and their radiation losses by the equivalent of spontaneous emission are reduced as well. Such optical cloaking devices do not yet exist, but one can gauge the progress in the required technology by considering the progress in negatively refracting optical materials.